While Sling TV does give you live access to ESPN and ESPN 2, users can not pause, record, or rewind the feeds for both of those channels. This morning, Dish’s Sling TV streaming service ended its invite-only period and opened the floodgates to anyone who wants to sign up for $20/month access. We’ve been messing around with Sling for a few days and have come across some issues you should take into account before deciding to sign up. While all of the channels currently available on Sling look like you can pause and rewind the stream, the majority of them — including the biggest ticket networks (ESPN, Disney, TBS, TNT) — do not allow any sort of rewinding or pausing of the stream. While Sling is available on Windows and Mac PCs, the service isn’t done through your web browser. Instead, it’s done through an app which has to be installed on each computer. While the one plus of this is that you can easily have the Sling window off to the side while you’re doing other things online, it also means you can’t just access the service anywhere. So if you were expecting to watch ESPN on your work computer, you’ll either need to make friends with the IT folks or use the Sling app on your phone. Since there is no rewinding of most Sling content and since there is no recording of any Sling shows, you’re left to rely on the service’s anemic slate of on-demand programming, which is really just shows from the few networks — like HGTV and Food Network — that allow rewinding. This is convenient when you just want to go back and watch some episode you missed from the day before, but it’s no Netflix. Unlike Netflix and other services that can be accessed simultaneously by multiple accounts, Sling will immediately stop the current feed if it detects another device accessing the same account. While that may be an effective way to keep people from handing out their login info to all their cheapskate friends, it also means that a family can’t share one account across multiple users. So if mom is on the road for work and wants to watch SportsCenter on her iPad, that means dad can’t also be watching Chopped back at home. 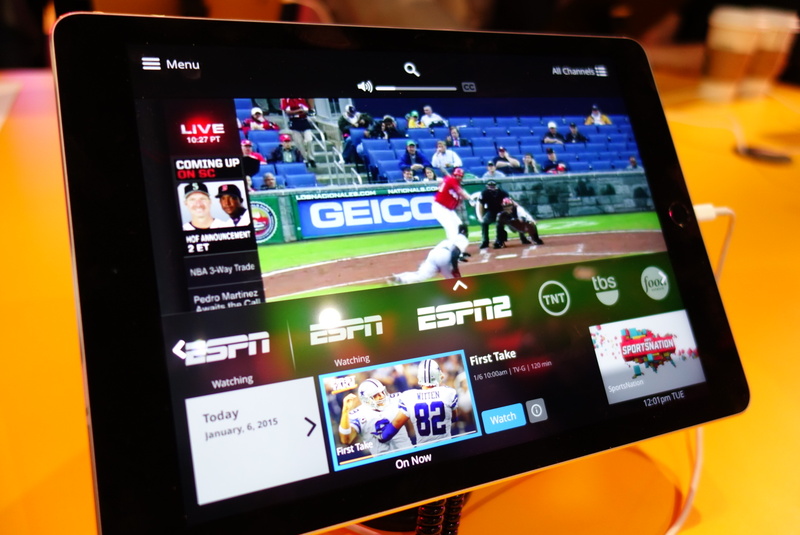 When Sling was announced, Dish said users could stream the service to their TV screens through gaming consoles, Amazon Fire streaming devices, and through Roku boxes and streaming sticks. But as of now, only the Roku products work to bring Sling directly to your TV. UPDATE: A few days after launch, Sling became available on Amazon Fire TV sticks and boxes. And since Sling is only available on PC via an app, Chromecast users can not use Google Cast to push the video from their computer to the TV screen wirelessly. In the end, none of these may be dealbreakers for you. But they are all things you should keep in mind before signing up for Sling. The service is offering a 7-day free trial, but you do need to enter a valid credit card before signing up. Sling TV Finally Adding Live Network TV, Multi-Stream Support. Is It Worth It?